There were two things I loved the most in high school. 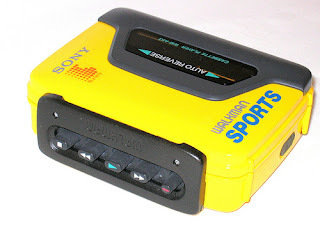 Music from bands like The Smiths and Depeche Mode and my Sony Sports Walkman. The Sony Sports Walkman was splash proof, so it was perfect for the beach and pool. It was yellow, which made it stand out and appear fashionable. It as somewhat of a fashion accessory to be honest. There was a heftier price tag attached to it, so it let others know you weren't skimping on your technology. I loved the way the side opened and closed. It was unlike the usual portable music players I had ever owned before. I also remember slapping a Smiths sticker on my Sony Sports Walkman alerting others of my impeccable taste in music. Did you have one? If so, did you love it? I could only dream of having a genuine Sony Walkman of any sort. I had to settle for the no-name brands typically found at Fedco or Gemco. Nevertheless, they served me well, giving me my daily dosage of Billy Idol and The Police as I went on my paper routes in 8th Grade (1984). Speaking of Walkmen…you gotta see this site! Nope. This thing is way before my time. We couldn't afford a real Walkman. I had a Lloyd's. It was just a radio and didn't have a cassette player. I remember listening to Spandau Ballet's "True" while doing homework. I know: "DORK!!!"